Hi y'all! I'm not usually one to post on a Tuesday, but this announcement called for it. 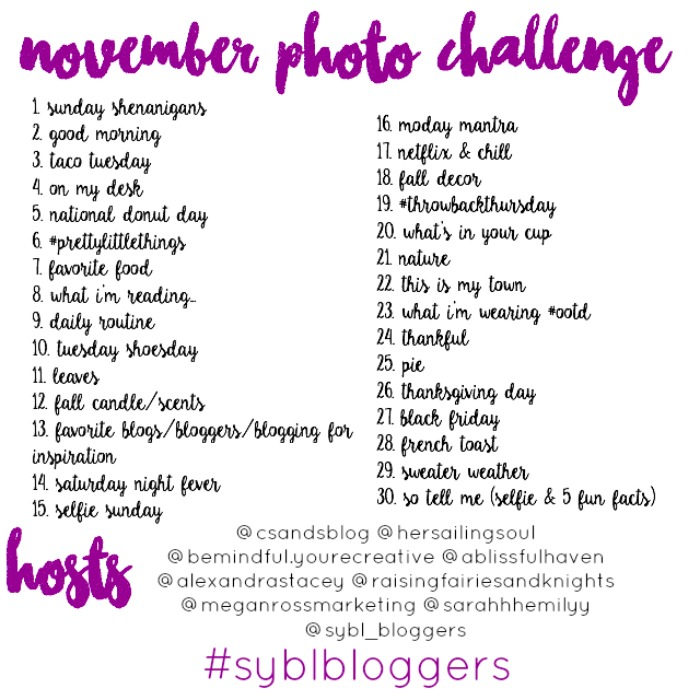 I am going to be co-hosting the November Photo Challenge on Instagram along with a wonderful group of bloggers associated with Show Your Blog Love. I am so excited about this opportunity. I have been following along with the #fallforSYBL hashtag, and the photos that everyone has been adding are absolutely gorgeous. Everyone has been putting so much thought into the prompts, and I can't wait to see what you come up with for this month. I hope you join in for as many as you can! If you can do a few or all of them, I would love to see how you interpret the prompts, and what is going on in your life during the month of November. Just make sure you use the hashtag #SYBLBloggers so that we can keep up with all the photos in the challenge. I especially can't wait to see everyone's pie and tacos! Yum!